Gaius Shaver has been traveling to Toolik Field Station for 34 summers to study how tundra ecosystems react to small environmental changes. One of his experiments involves building greenhouses over 8-by-16 foot plots of land to gauge how plants react to warmer soil. His research has yielded interesting results over the years, but there’s always been a question of how well that data would translate over large tracks of land. Suddenly, Mother Nature gave Shaver and many other Toolik scientists a way to find out. A massive fire burned about 400 square miles of tundra along the Anaktuvuk River from July to October 2007. It was the largest tundra fire ever recorded on Alaska’s North Slope. Now the scientists are studying how the area, which is roughly the size of Cape Cod, responds. In addition to examining the warming soil and plant changes, the group is looking at how much carbon was lost in the fire, the ongoing exchange of carbon between the land and air, and how melting permafrost is affecting rivers and streams. They’re finding that the fire has had a significant impact in all these areas. And given that continued warming in the Arctic will likely lead to more lightning which will lead to more fires, these are important questions to answer. The group calculated that the fire burned more than two million tons of carbon that had been stored in the soil, or roughly 25 years worth. This equals about 10 percent of the annual carbon emissions for the city of Boston. The fire also burned between 300 and 1,000 years worth of nitrogen. The group is also interested in the continued changes in carbon exchange between the soil and atmosphere. Using instruments set up on three towers in the burn site, they’re measuring the exchange of carbon during the summers. If plants photosynthesize more than they and the soils in which they grow respire, then the net result is carbon being removed from the atmosphere. If there’s more respiration than photosynthesis, then the opposite is true. Overall, the burned areas have a net carbon loss from the soil, meaning more carbon is being released into the atmosphere than at unburned spots. The researchers calculated that in 2008, the fire accounted for a minimum 2.8 percent reduction in the amount of carbon being taken out of the atmosphere across the North Slope even though the Anaktuvuk River Burn accounts for only 0.55 percent of the North Slope’s area. The researchers know from older fires and erosion scars that shrubs tend to dominate the landscape after a disturbance at the expense of mounds of tussock grasses, which cover much of the North Slope. This seems to be playing out at the Anaktuvuk River Burn. Although shrubs were knocked back dramatically by the fire — even more than the tussocks — they are recovering rapidly even in severely burned areas and may soon exceed the grasses in the amount of ground they cover. Undisturbed tundra tends to keep its plants in pretty consistent ratios as they compete for limited resources in the soil. “A disturbance shakes up those relationships among species,” Shaver said. This is important because shrubs tend to insulate the soil in the winter, keeping it warmer, and also hold less carbon below ground than tussocks do, both of which can further change the landscape. Another striking discovery is the change in albedo, meaning the percent of the sun’s radiation that is reflected away from the ground. In the first summer after the fire unburned portions of the burn site had a 17 percent albedo while severely burned sections had a 3.5 to 4 percent albedo. That means an additional 13 percent of the sun’s radiation was being absorbed in those areas. And that heat has to go somewhere, often warming the soil to higher temperatures and permeating deeper than normal. This difference was less in 2009 than in 2008, and Shaver said it will eventually return to the level of unburned tundra. In the meantime, increased heat flux into the ground can cause thermokarst failures, which occur when the ice that’s normally frozen solid in permafrost melts and the land above it collapses like a soufflé. Last summer the group noticed more and more of these depressions as the season continued. When thermokarst erosion happens near streams and lakes, it dumps extra nutrients into the water, giving microbes, plants and fish access to more food and thus changing the aquatic ecosystems. “We can’t make a treaty to stop thermokarst and fires,” said Syndonia Bret-Harte, an associate professor at the University of Alaska Fairbanks, who is heading up the plant studies at the burn. Bret-Harte, who is also Toolik’s associate science director, was at the station in 2007 while the fire was burning about 25 miles away and at times could see a wall of smoke in the distance. “It was awesome and beautiful, but disturbing at the same time,” she said. 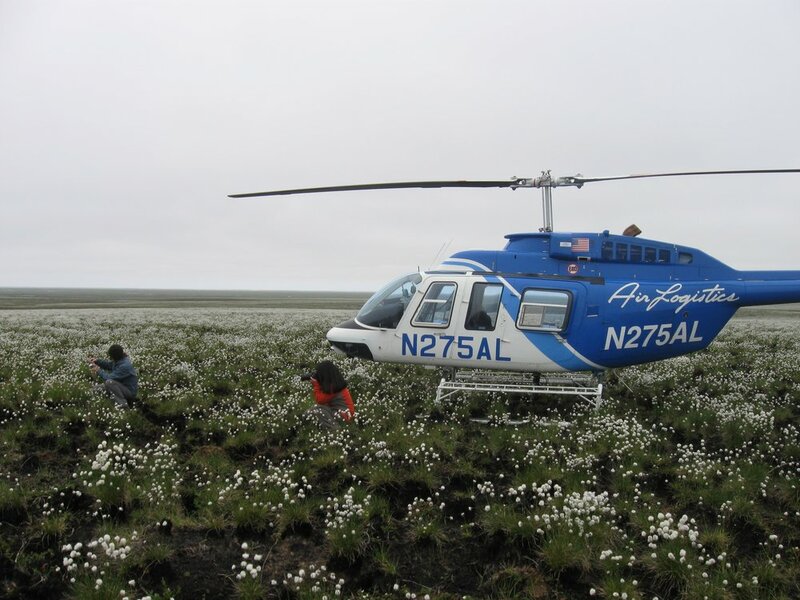 Once the scientists realized how big the fire was, Shaver applied for an NSF grant for the following summer, knowing how valuable the natural experiment would be for the scientists at Toolik, many of whom are part of an ongoing Long Term Ecological Research Project, one of 26 in the U.S. LTER network. The group is adding a component to this summer’s research by visiting the sites of two large fires from 1993 to see how they’re recovering in hopes of predicting how the Anaktuvuk River Burn will fare in the coming years. They’ll take measurements to see, for example, how much soil has accumulated above the char level and what the diversity of plant species is like. All of this is crucial information to have as more and more disturbances like lightning-driven fires and thermokarst occur across the Arctic.